This, to me, is the taste of New Orleans. 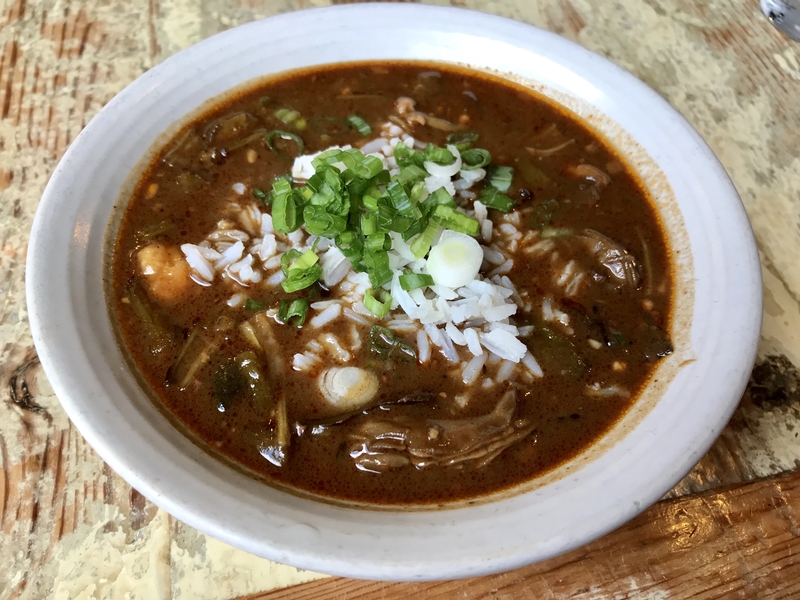 Seafood gumbo – deep, dark, murky, with an intense roux that makes the flavors sing. I had mine at Peche, the ode to local seafood created by Donald Link, Stephen Stryjewski and Ryan Prewitt. Pure pleasure. 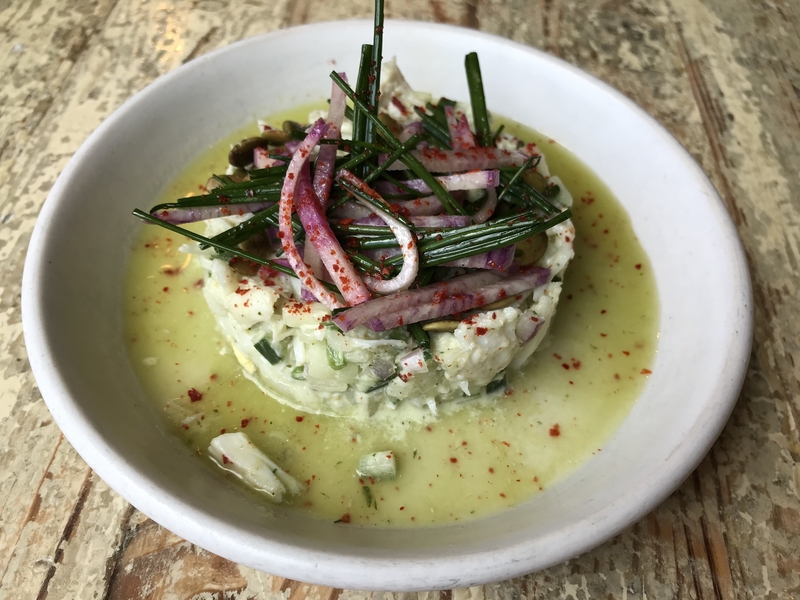 The crab salad of your dreams: a little cucumber, a little dill, a bit of lemon and a lot of crab. Pure, clean flavors. Wow! We went on to other dishes – this is a lovely restaurant – but these two dishes are the ones that linger in my mind when I think of New Orleans. Where do New Orleans chefs eat on their nights off? 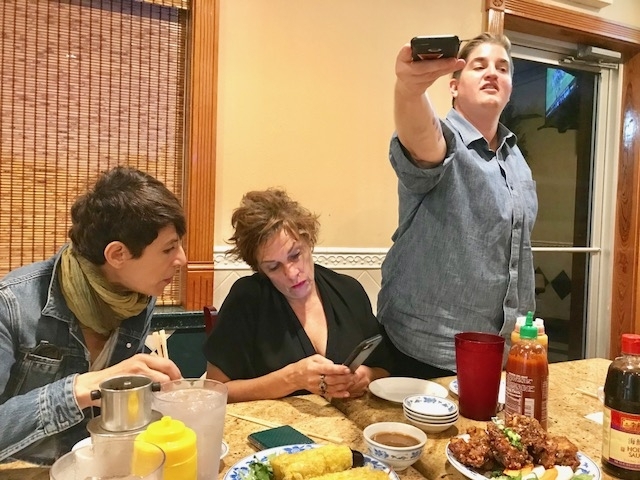 Kelly Field, of Willa Jean, took Dominique Crenn and Barbara Lynch to Tan Dinh, a cavernous, barebones bowling alley of a restaurant with fantastic Vietnamese food. 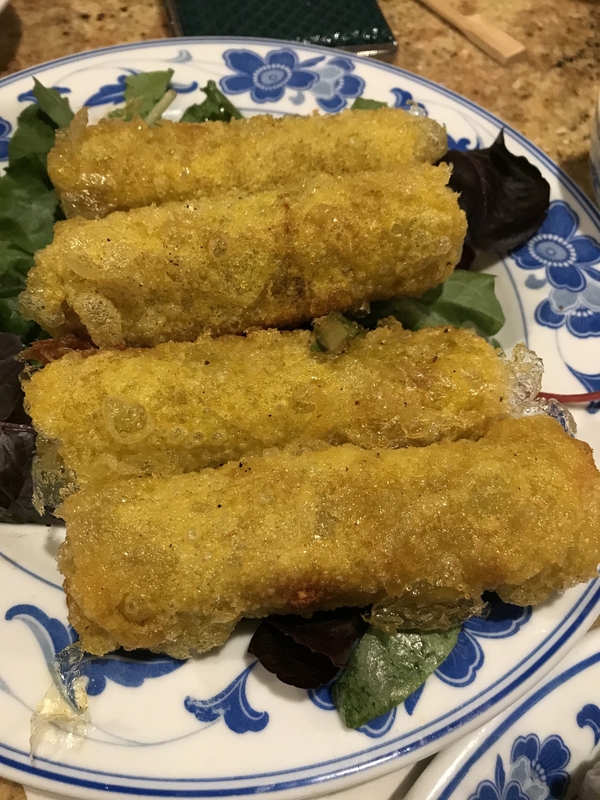 These egg rolls don’t look like much, but I found myself reaching for another, then another, then…. Couldn’t stop. 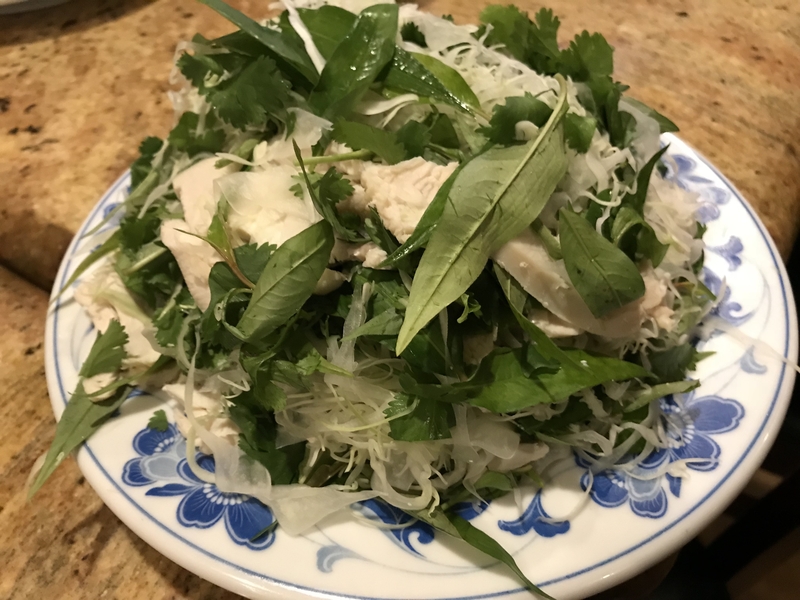 This simple noodle salad, with it’s slim slices of chicken and whole ram rau leaves, was equally impressive. Enormous squeeze bottles of various sauces allow you to spice your food to your own taste. 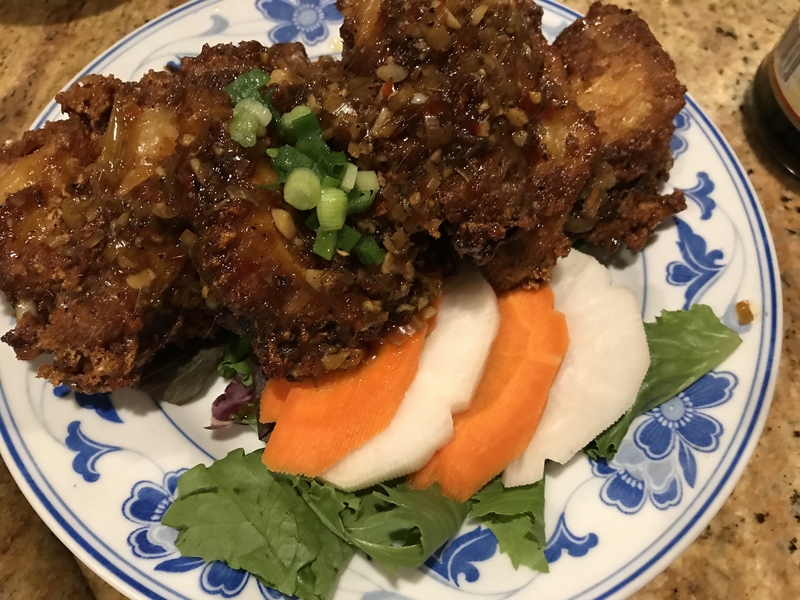 Lemongrass chicken wings: deliciously gooey and good. But if I’m being honest, the best meal I had in New Orleans wasn’t in a restaurant. It was red beans and rice at the home of my friend Pableaux Johnson, who among other things makes the best cornbread I’ve ever tasted. Every Monday night Pableaux asks a group of people over to share the classic Cajun meal around his grandmother’s old table. You bring whatever you want to drink, and show up when you want. People come and go all evening; as I was leaving, around midnight, a couple was just strolling up to the door. It’s friends, strangers – a motley group of interesting people who gather to eat off mismatched plates and drink out of whatever glass they can scrounge up out in the kitchen. But mostly you come to laugh, talk and meet interesting people. It’s the most perfect kind of entertaining – you leave completely satisfied: filled with great food and new ideas and blessed with new friends. This, I thought, as I poured cane syrup over that incredible corn bread, is why people live in New Orleans. Thanks Pableaux!